A mythic being who helped the Zunis in their search for the Middle Place, or what is now understood as Zuni Pueblo. Water striders are graceful-looking insects that, when they extend their long legs, can walk on water. Because the Zuni live in a high, arid desert environment, water and those beings associated with it, such as water striders and dragonflies, play roles having cultural and spiritual significance. 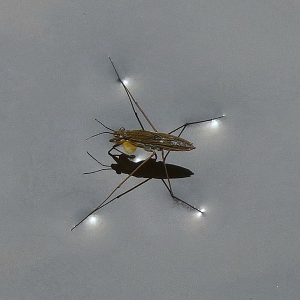 "Water strider insect in the water" by Schnobby is licensed under CC BY-SA.